For all the angst about the lack of Flash on Apple’s iPads and iPhones, most of the discussion seems to center around video. But a bigger impact by far is on display advertising, which tends to be done mostly in Flash. Adobe needs non-Flash alternatives for tablets and smartphones, particularly for people who design display ads. 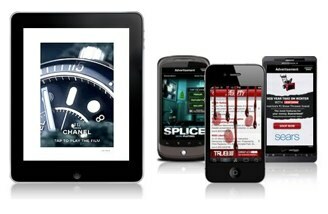 Today, Adobe announced that it is integrating Medialets’ mobile ad platform into its own creative suite. Designers will be able to insert Medialets ads into InDesign layouts and then serve them on mobile apps. The reason this is notable is that Medialets essentially will become the de facto plug-in mobile ad server for Adobe. Medialets’ technology works with iOS devices and will also work with Flash in Adobe AIR apps. It powers the ads in The Daily iPad app, for example, a position it won over Apple’s own iAds. Mobile display advertising is still very nascent, especially in apps. Even Apple is having trouble getting advertisers to renew their advertising contracts, so much so that it recently had to reduce the minimum amount for an iAds campaign from $1 million to $500,000. Steve Jobs can sell a $1 million mobile ad campaign, but his junior sales people can’t. Also, Apple charges differently, taling a percentage of an app’s ad revenues instead of charging a flat fee. Getting built into Adobe’s suite is a huge deal for Medialets, which can use all the help it can get in going up against Apple, Google, and other large mobile advertising platforms.